Region: Village of Bar Harbor, on Mt. Desert Island. A Retreat from the Everyday. Open year round. Enjoy a getaway to this historic Victorian house offering single rooms and one- and two-bedroom suites, all with private baths, some with working fireplaces, private balconies, A/C. Your day begins with coffee from the tray placed outside your room; then enjoy a made-from-scratch breakfast served on a sunny, enclosed porch. Baked goods are made from scratch each morning. Enjoy afternoon refreshments on the veranda or in front of the living room fireplace. Play croquet on the lawn, or take a nap in one of our hammocks. Restaurants, shops, and ocean-oriented activities are only a short walk away. Free off-street parking. The inn is only a mile from Acadia National Park with a myriad of opportunities for walking, hiking, bicycling, birdwatching, photography or painting. 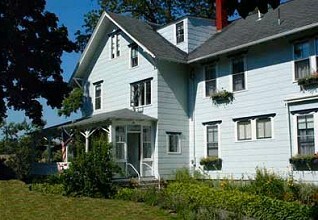 This and other Bar Harbor Bed Y Breakfast Inns can be found here online in The Register. A warm comfortable bed and a great breakfast can make for a great vacation or business travel day!